Petersen: "Just made too many errors in our first game against a good opponent." CHRIS PETERSEN: The guys played hard. Proud of them for that. Just made too many errors in our first game against a good opponent. We’ll get them corrected, just keep playing hard, and we’ll make progress. Q. Coach, it looked like the team was able to put together some good drives, but the defense, Auburn’s defense, seemed to kind of limit you to — forcing you into three points versus six. Is that just a testament to how good their defense played, or was there kind of a lack of communication on the offense? CHRIS PETERSEN: Well, there’s all that for sure. It’s a really good defense. They played like that all last year, and it’s us — you get in the red zone, you’ve got to be very detail oriented, and you’re splitting hairs down there, and against a good defense, if you don’t have your details taken care of, you’re going to end up kicking too many field goals. Our defense kind of did the same thing for the most part, made them some kick some field goals. They kind of played hard down there. Auburn made some pretty good big chunk plays, and then our defense made them kick some field goals. We’re close, but that doesn’t count in a game like this. Q. You’ve had a couple chances down here in Atlanta to play SEC teams, and you’ve played well but not been able to win. Can you quantify just coming this far from home? Is that the difference in maybe getting one of these, or are there some more things that you feel like you need to do to compete? CHRIS PETERSEN: Yeah, we’ve got to got better, no question. This one felt a lot different than last time we were down here just because there was a lot of first-game mistakes. We had protection busts, and we don’t snap the ball correctly at the end of the game at crunch time and a lot of those type of things that will get worked out, but it’s frustrating when you go into a game like this knowing it’s going to come down to a bunch of details. You can talk about it all you want, you’ve got to keep practicing and going to the fire a little bit to get better at it. Q. Even with the loss, what does it mean for you to see Myles get the accomplishment, kind of a bittersweet moment? How would you describe what Myles means to the program after a game like this? CHRIS PETERSEN: Yeah, he’s a heck of a running back. Yeah, we’ve got to keep getting him and Salvon the ball and keep mixing those guys. Q. How much practice time or how many days were you able to rep Jared Hilbers in there with that first group in preparation for him to play in place of Trey? CHRIS PETERSEN: Let’s see. Over a year, when Trey got hurt. He’s taken a ton of reps. I think he did a good job, and he’s ready to go. Q. With the issues that they were having in terms of covering your wide receivers, was there any plan of going to more of an aerial attack versus a ground attack in this game? CHRIS PETERSEN: Yeah, our receivers did a good job making plays on ball, no question about it. It’s always easy to kind of sit back here and think, should we have thrown it more and all those things. We’ll analyze the tape and we’ll all get better. We asked the kids last night and all week, just play hard, go fast, don’t think. The rest is on us as coaches, and we’ll go back and we’ll tighten it up and we’ll have them thinking less and making less mental errors, and we’ll see. Keep working like we’ve been working, and we’ll be okay. Q. Your guys really played hard today, gave it a great effort. What can you guys — what’s the most significant thing that you guys can take from this game going forward? CHRIS PETERSEN: Yeah, you know, they’ll already know it, but it all comes down to details when you’re playing evenly matched teams. It’s going to be decided by just some really big-time plays by a couple individuals is usually what it is, and that’s what I think. We’ll get some things tightened up. We had a few first-game, I-can’t-believe-that-happened, the first interception that Jake threw on the scramble, a protection bust, and he had to scramble out of there. He should have thrown it out of bounds; don’t make a bad play worse. But those type of things I don’t think we’ll make moving forward, but I think it’s all about tightening up the details. Q. Aaron Fuller to have a career day effectively, yards, receptions, what allowed him to have so much success against Auburn? CHRIS PETERSEN: A lot of hard work for the last year. I think you guys have been seeing it. The kids have worked hard, and we knew our receivers would make plays. They’re going to be good players this year. It’s not any one thing. From January whatever, when we finished our game, that kid has been working his tail off. Q. Chris, just your quick evaluation of the offensive line, obviously two first-time starters out there, and Trey Adams is a long-term thing do you think? CHRIS PETERSEN: Don’t know. Don’t know about that. We’re getting the doctors to look at him and figure it out. It could be, might not be. I don’t know. He practiced his tail on Monday and was rocking and rolling, and then he wasn’t. What was the other question? Oh, that’s hard for me to know. I mean, you put the tape on him — there were some creases there, our backs hit them, but I know there’s going to be a lot to clean up there. Going against a really good front seven tests you right away. Q. First of all, Joel Whitford, did he get dinged up on that tackle? And secondly, what did you see out of Race Porter coming in? CHRIS PETERSEN: He did not get dinged up on that tackle. He had been battling a little injury all along, so that’s what that was. And then, yeah, Race, we have some work to do in our coverage units without question. We’ve got to kick the ball better and we’ve got to cover better. Q. What’s your evaluation of Jake’s performance? He had a couple turnovers but some big plays? CHRIS PETERSEN: Yeah, he’s always a hard one for me to evaluate sitting here. I kind of feel like he’s kind of like the O-line. It’s easy to cast stones sometimes at that position, and you you’ve got to see what he was looking at. He threw some nice balls in there and he was poised on occasion. I know the one pick on the sideline he’s got to throw that away, and a lot of first-time stuff. CHRIS PETERSEN: I didn’t see it. I didn’t see it. I don’t know. I’ll have to look at that. Q. Chris, you guys get evaluated on these sort of non-conference games early in the season. You’re not at your best, they’re not at their best, yet you’ve got to go back in the Pac-12 and made an impression. Do you think this is a game that helped you, hurt you in terms of just how people view your program? 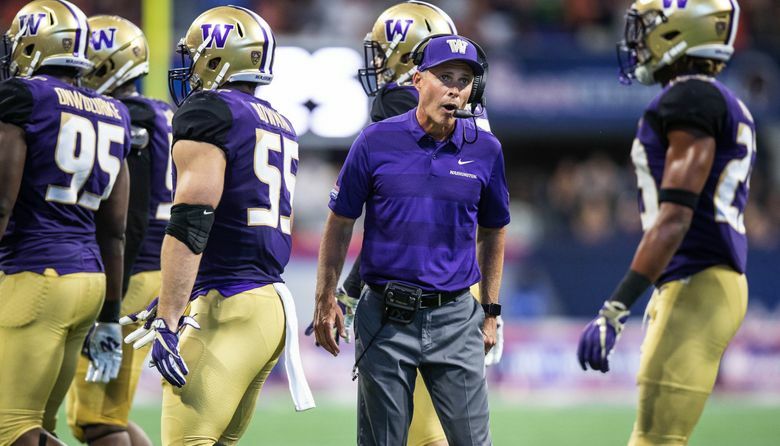 CHRIS PETERSEN: I don’t really know, and I really don’t care. I just really don’t. I mean, I don’t know how to say it any different. I mean, it was game 1 against a good opponent, coming across the country, hostile territory, kids battled hard, we’ll just see where our team goes from here. It’s a long season. Had we won, I’d feel exactly the same, exactly the same. Kids stepped up, played a top team in the country, proud of them, and it’s a long season from here on out.